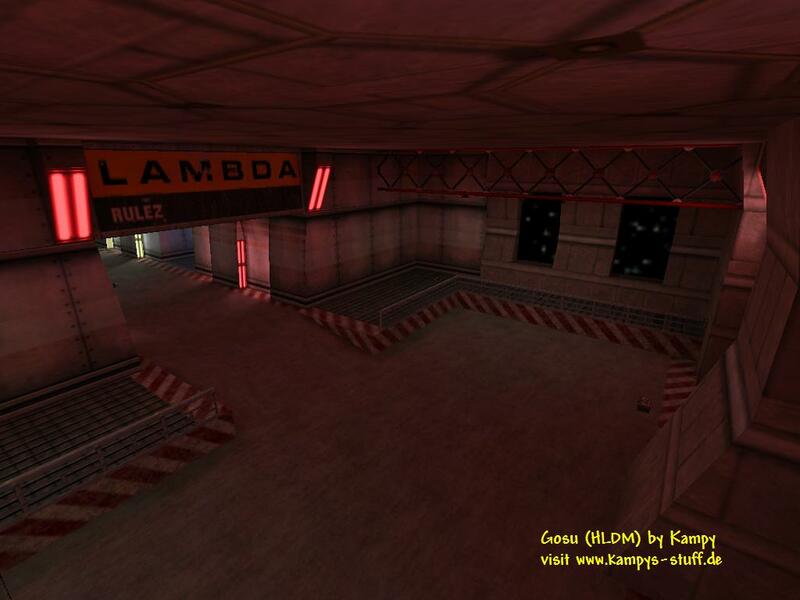 This is a medium size map with a lab/xen theme. The grafic looks pretty cool even if there are hardly any custom textures. There are several funny features in Gosu like a transporter which beams you into the xen world where you can find a dead HEV suit guy with the taucannon or a bathroom where a scientist is sitting on the toilet and telling you a funny sentence when you come near. Another cool part of the map is the included alien environment inside the lab where the gman whatches the behaviour of an alien (there are some monsters included which dont attack you). The map just looks great - there are cool light effects and architecture plus some cool chargers. 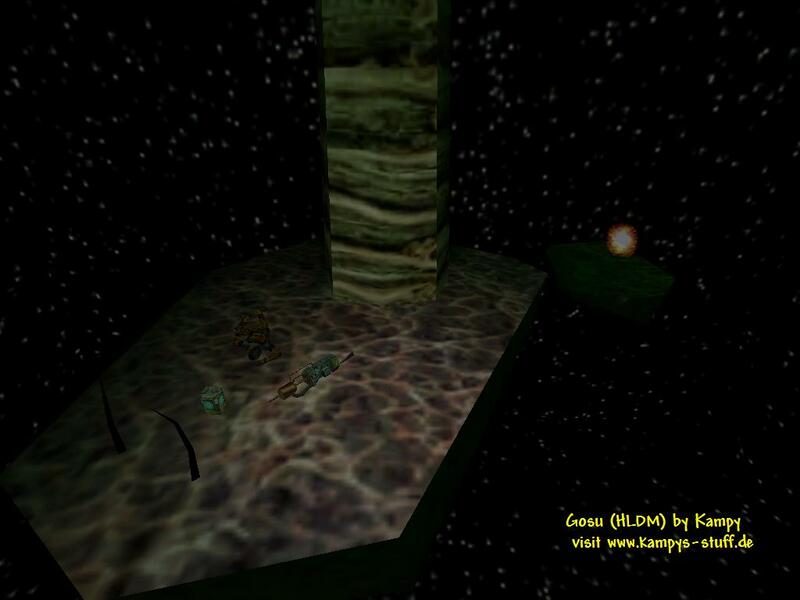 Most of the map is lab-like although in a new, cool style and there's the alien environment and the platform jumping xen world. The connectvity is alright, there is always a third way you can choose and there are no dead-ends. The map plays very good, the item placement is well done with no parts of the map where it wouldnt make sense going into. 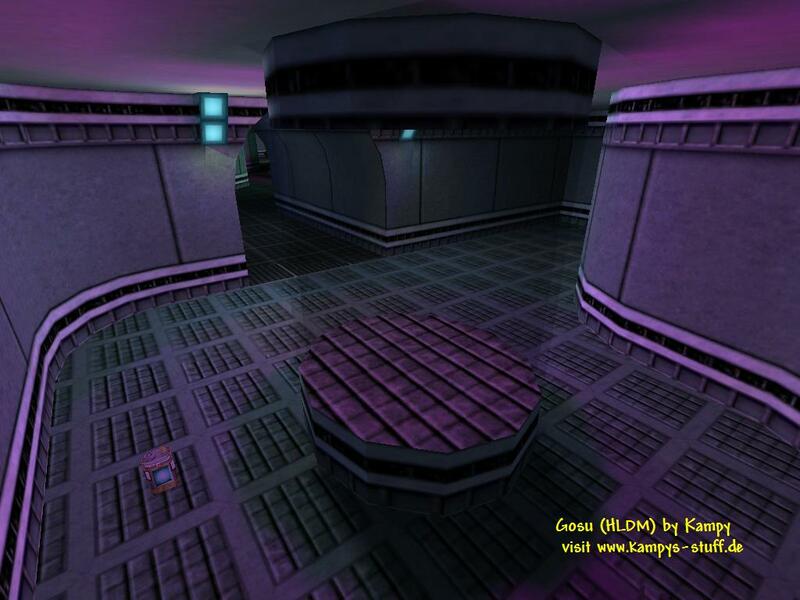 The gauss is harder to get then the other weapons, cause you need to jump over some platforms with low gravity and there's only one way out of the xen world. There are all weapons, but you cannot reach the glueon which is outside the lab and you can see it from inside. Gosu contains a lot of cool sounds like a lab speaker sound that says: "No you will not escape!". The r_speeds are always under 500 which is amazing if you consider the great look of the map. This is definately my best-looking medium size map and you should really check it out - it's fun, it looks cool and it plays nicely! Download now! - There is a nuke point at the bathroom "the mirror"
- there is gauss ammo down at the heavy machinery. Get it when you already have the gauss, then jump out with the gauss jump again. you can also try to jump across the machine to get another gaussclip, but that's very hard you better use the gaussjump to get the other gaussclip, too.